MEMORY is an interactive exhibition of digital photography by Martin Bricelj. It is documentary photography with a powerful personal note, since the memory, a record of the moment, is presented as a detail of the author's everyday view with a strong graphic and abstract connotation. The key to understanding is author's gaze, directed at graphic details of urban space. The representation of abstract snapshots, stolen from the author's hectic everyday, is unusual. 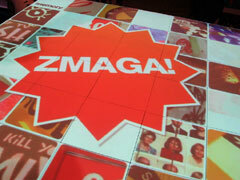 Instead of hanging framed images on the gallery wall, they are available through an interactive game. The connecting link between chaotic multiplicity of everyday moments and sought continuity is MEMORY. Hence the exhibition adopts the form of a known game, MEMORY. Gallery placement of the interactive photo exhibition Memory is conceived as a surface projection on a flat horizontal table. 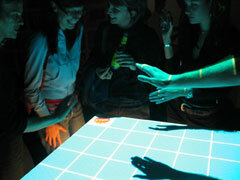 Using an appropriate interface, the visitor/participant can influence the sensors by touching them. The sensors react witha flipping of the play tablets – photographs. The aim of the game is to pair exhibited photos as soon as possible. By swiftly scrolling through these abstract details, we approach Bricelj's view of the world. Gallery placement is an innovative way of communication between author and visitors, spectators-players. This can be experienced at the very entrance, where the visitor has no choice but to make a decision. Instead of being passive, a spectator can become an active player by choosing to participate in a game. It is in this way, that Martin Bricelj places his latest, seemingly playful interactive project Memory, among his earlier, more socially-critical projects. The exhibition catalogue is just as unique, since it is designed as a cardboard box of the game Memory, containing his photographs as play tablets, while the introductory text takes the form of user's guide. Project Memory is also an interactive web game, available on a web address www.memoryplay.com. It is available in a single or multi player version, which allows an online competition. Players can upload their own photos and play the Memory game using them. Through these uploads, the web page will change and become a group exhibition of various photographers. Martin Bricelj is a multi-faceted designer, artist and networking professional of the contemporary art scene and DJ-VJ motivated groups in Ljubljana. He aims to produce, display and develop all kinds of urban-radicalised and art-design projects (editorial illustrations, publishing, advertising, packaging layouts, logos, flyers, newsletters, books, 4C printing, Web design) with which he aims to fight the copyright protection of technology and purely commercial digital contents. Martin Bricelj is a kind of consortium, as he also functions within an enterprise-cultural association, which has the objective to work together with other groups and individuals on topics common to urbanity: access, the media hype, lack of political consciousness among citizens, lack of radical statements. He is a computer-based contemporary consortium that relates to projects that question public involvement and the mobility of activist’s spaces. Bricelj focuses on the interface between popular culture and technology underlying the social aspect of an artwork rather than simply developing technology for elite usage. Technology is not neutral and the medium is not the message. Values are even inherent to hardware design tools as well as to software which today constitutes a political statement. Are you a PC addict or (ex-) Linux follower? Memory by Martin Bricelj is an interactive digitalized game with photography for enhancement of urban life that seems to survive happily today without memory. Pre-recorded urban photographs by Martin Bricelj (and on the Internet also by different users), re-edited and displayed as simple children games, are used to test our speed and eye tracking of visual data. Bricelj recorded a set of snapshot images and gave us the chance to rewind and replay them in the gallery space or on the Internet. Memory, the game, involves some fast photographic actions and some precarious shooting situations. Memory is all about photography, but has nothing to do with camera angles and lenses. It has everything to do with file formats, memory cards, storage devices and storage strategies. On the web, Memory depends directly on our future inputs on Bricelj’s project. Memory as a game continues to increase the interpretative size and usage of photo images; their meaning depends also on our ability to play the game. Memory is about visual images and the role they play in construction and negotiation of self, the Other and the space. The game activates four elements: radius, direction, speed, and time. Radius: everybody from children to seniors can play the game. Direction: it can be played in the gallery space and on the Internet. Speed is of crucial importance; speed is a technique with which to attain a high-ranking position in the game. Speed tests the user’s process of fast memorization, the skills of reactions and a precondition for certain generations to deal with new media and technology. Time is a twofold category. In the gallery, it is limited; on the Internet timeless. The available time for playing the game Memory can be a day, a week or several months and it changes according to the possibility of access to the photographs in the gallery or on the Internet, transforming them into personal, mechanical, temporal and environmental archives. The photographs that are stored and with which we play and access Memory are therefore "archival memories". 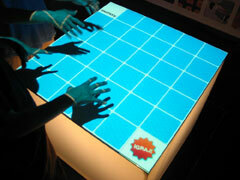 Memory is an easy interactive game that allows the user to interpret or rather to (re)play memory. Memory in Memory functions as a device with which data can be repeatedly re-memorized so that it is not lost when the computer is turned off. Memory does not require a battery backup! When users switch their computers off, memory always-already waits! The photographs are stored on various recording media, but only online can they be accessed each time they are requested. Even more, we can say that photographs within Memory become popular-personal-political icons (PPPI) as they are transformed into space markers displaying memory as a sort of map. The game raises questions of relations between technology and popular culture. Instead of a simple influence between them it is possible to ask does technology drive popular culture, and how much popular culture affects new media technology? What is “educational” about video games, “zines,” and computers? In order to draw attention to these questions, Bricelj uses a variety of cultural frameworks: low technologies, popular culture hypes and playing digitalized photography against memory. All these different forms, however, can easily be understood by different users. Memory rearticulates how [critical] memory works and how photography can be used to integrate personal, social, and professional aspects of our lives. 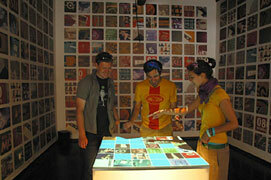 In short, Memory by Bricelj is a sort of Jukebox that instead of music stores, manages, and plays back photographs. With Memory we learn that memory is a trickster.